For financial options, see Mountain range (options). A mountain range or hill range is a series of mountains or hills ranged in a line and connected by high ground. A mountain system or mountain belt is a group of mountain ranges with similarity in form, structure, and alignment that have arisen from the same cause, usually an orogeny. Mountain ranges are formed by a variety of geological processes, but most of the significant ones on Earth are the result of plate tectonics. Mountain ranges are also found on many planetary mass objects in the Solar System and are likely a feature of most terrestrial planets. The mountain systems of the earth are characterized by a tree structure, where mountain ranges can contain sub-ranges. The sub-range relationship is often expressed as a parent-child relationship. For example, the White Mountains of New Hampshire and the Blue Ridge Mountains are sub-ranges of the Appalachian Mountains. Equivalently, the Appalachians are the parent of the White Mountains and Blue Ridge Mountains, and the White Mountains and the Blue Ridge Mountains are children of the Appalachians. The parent-child expression extends to the sub-ranges themselves: the Sandwich Range and the Presidential Range are children of the White Mountains, while the Presidential Range is parent to the Northern Presidential Range and Southern Presidential Range. The position of mountains influences climate, such as rain or snow. When air masses move up and over mountains, the air cools producing orographic precipitation (rain or snow). As the air descends on the leeward side, it warms again (in accordance with the adiabatic lapse rate) and is drier, having been stripped of much of its moisture. Often, a rain shadow will affect the leeward side of a range. Mountain ranges are constantly subjected to erosional forces which work to tear them down. The basins adjacent to an eroding mountain range are then filled with sediments which are buried and turned into sedimentary rock. Erosion is at work while the mountains are being uplifted until the mountains are reduced to low hills and plains. The early Cenozoic uplift of the Rocky Mountains of Colorado provides an example. As the uplift was occurring some 10,000 feet (3,000 m) of mostly Mesozoic sedimentary strata were removed by erosion over the core of the mountain range and spread as sand and clays across the Great Plains to the east. This mass of rock was removed as the range was actively undergoing uplift. The removal of such a mass from the core of the range most likely caused further uplift as the region adjusted isostatically in response to the removed weight. ^ "Definition of mountain system". Mindat.org. Hudson Institute of Mineralogy. Retrieved 26 August 2017. ^ Rosenberg, Matt. "Pacific Ring of Fire". About.com. ^ "Nepal and China agree on Mount Everest's height". BBC. 8 April 2010. ^ "The mid-ocean ridge is the longest mountain range on Earth". US National Oceanic and Atmospheric Service. 11 Jan 2013. ^ "A Guide to the Geology of Rocky Mountain National Park, Colorado". USGS. Archived from the original on 2012-10-24. ^ Egholm, David L.; Knudsen, Mads F.; Sandiford, Mike (2013). "Lifespan of mountain ranges scaled by feedbacks between landsliding and erosion by rivers". Nature. 498 (7455): 475–478. doi: 10.1038/nature12218. PMID 23803847. ^ Mitri, Giuseppe; Bland, Michael T.; Showman, Adam P.; Radebaugh, Jani; Stiles, Bryan; Lopes, Rosaly M. C.; Lunine, Jonathan I.; Pappalardo, Robert T. (2010). "Mountains on Titan: Modeling and observations". Journal of Geophysical Research. 115 (E10). doi: 10.1029/2010JE003592. ISSN 0148-0227. ^ Gipson, Lillian (24 July 2015). "New Horizons Discovers Flowing Ices on Pluto". NASA. Retrieved 25 July 2015. ^ Keep, Myra; Hansen, Vicki L. (1994). "Structural history of Maxwell Montes, Venus: Implications for Venusian mountain belt formation". Journal of Geophysical Research. 99 (E12): 26015. doi: 10.1029/94JE02636. ISSN 0148-0227. ^ Plescia, J.B. (2003). "Cerberus Fossae, Elysium, Mars: a source for lava and water". Icarus. 164 (1): 79–95. doi: 10.1016/S0019-1035(03)00139-8. ISSN 0019-1035. ^ Jaeger, W. L. (2003). "Orogenic tectonism on Io". Journal of Geophysical Research. 108 (E8): 12–1–12–18. doi: 10.1029/2002JE001946. ISSN 0148-0227. 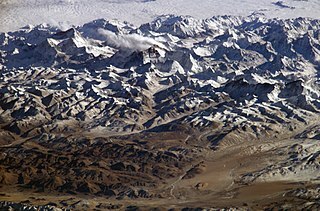 Wikimedia Commons has media related to Mountain ranges. Wikivoyage has a travel guide for Mountain ranges.